This quick and easy Roasted Cauliflower with Garlic Tahini Sauce will have you falling in love with cauliflower. It’s naturally vegan and gluten-free, and easy to make. Read on, or jump straight to the recipe, HERE. 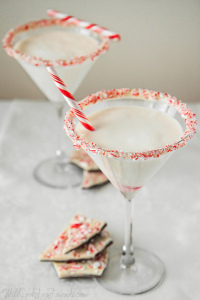 You guys, I just realized as I edit these photos how freakin’ Christmasy they look. Like unintentional little red-white-and-green Christmas trees. Oops! Guess I should’ve shared this recipe back in December? But hey, I’m not going to let that stop me, because it’s just way too tasty to keep all to myself. Cauliflower doesn’t get talked about a ton, but it’s one of my favorite veggies. (Shhh, don’t tell the green beans!) And I KNOW you know what I’m about to say: my favorite way to prepare it is roasting it in the oven. I am so predictable. But seriously, cooking cauliflower any other way can leave it soggy and bland. Roasting brings out the sweetness and gives the edges a beautiful golden-brown char. Without a doubt, roasting is the way to go. This is actually a re-vamp of an old recipe I shared way back in 2011. To this day that recipe is one of my favorite ways to eat cauliflower, but this time I decided to mix it up a little by simplifying the ingredient list and making the sauce entirely vegan. You might be wondering, how can a creamy sauce possibly be vegan? The answer is, cashews. Cashews are like the magic ingredient in vegan sauces, because they have a super mild and creamy flavor when blended up with other ingredients. In this case, a little tahini and a whole head of roasted garlic bring tons of flavor to the sauce. The richness and protein from the cashews and sesame seeds make it super filling, too, so even though this dish is basically just vegetables, you’ll be surprised how hearty and satisfying it is. 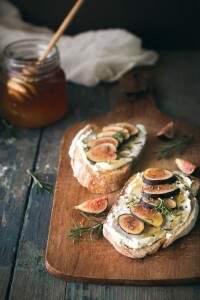 Before we jump into this recipe, I want to introduce you to a friend of mine — Lauren over at the blog Lauren Caris Cooks. Lauren and I have been blog buddies for going on two years now, and though we’ve never met in person, I’m pretty sure she and I would get along like sisters in real life. If only we didn’t live half a world apart! It was actually Lauren who inspired me to do these 31 Days Of Healthy Recipes in the first place. Back in December, she did a recipe advent calendar — that’s 24 days of recipes leading up to Christmas — which I thought was such a cool idea. 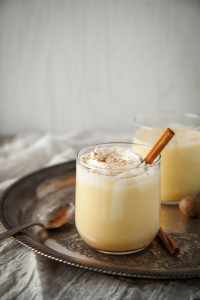 Even though the holidays are over, those recipe are still season appropriate and yummy as ever, and you can check them all out here. 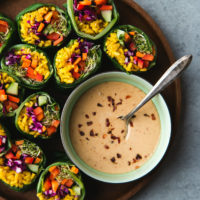 If you’re in the market for more healthy and simple vegan recipes, Lauren’s blog is the place to go! Are you a cauliflower lover or hater? Do you have a favorite way of preparing it? Share in the comments below! Add all ingredients except the water and salt to a food processor. While blending, drizzle in the water a little at a time until the sauce starts to become smooth. Continue processing, scraping down the sides or adding additional water as needed, until the sauce is as smooth as your food processor can make it. Add salt to taste. Remove the leaves from the base of the cauliflower, but leave the stem intact. Slice the cauliflower into 1-inch thick slabs (I like to call them "steaks" just for funsies). The center of the cauliflower should hold together, while the edges may crumble into florets, but that's okay. 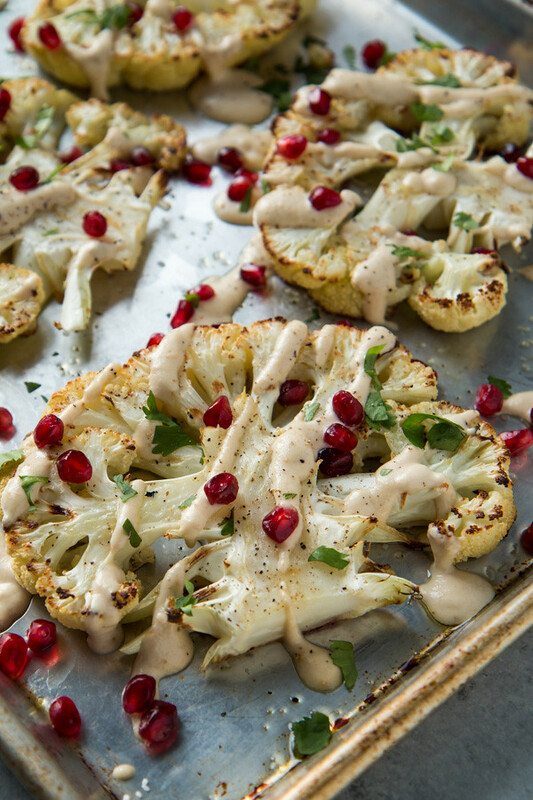 Place all the cauliflower on a baking sheet (line with foil or parchment for easier clean-up) and drizzle with olive oil. Season generously with salt and pepper, and roast for about 25-30 minutes, or until the cauliflower is tender and the edges are golden brown. 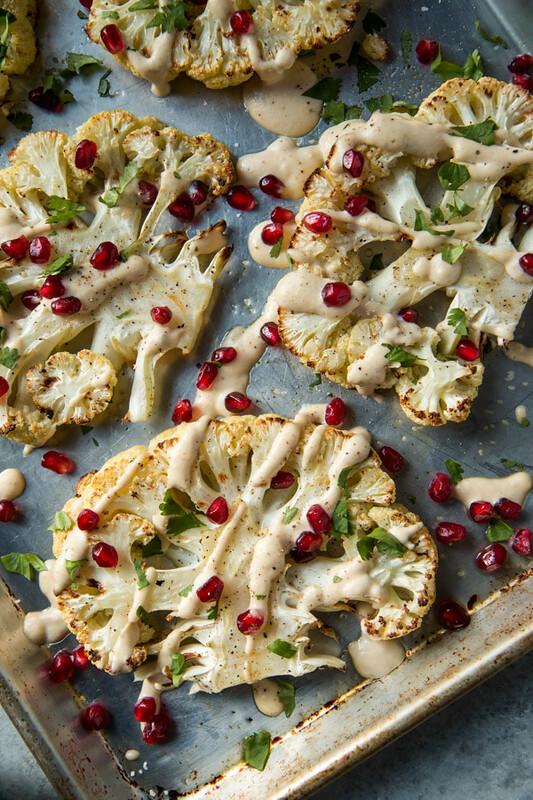 Drizzle cauliflower with garlic tahini saucce, and sprinkle with fresh pomegranate seeds. Garnish with freshly chopped cilantro or parsley (whichever you prefer) and dig in! *You can find my tutorial for how to roast garlic, here: How To Roast Garlic <-- in this tutorial, I roast the garlic at 400 degrees F.. You can totally do it at 375, though, and have the garlic roasting at the same time as the cauliflower. I like to throw my garlic in the oven about 15 minutes before the cauliflower, and pull it out a few minutes before the cauliflower is done. This way I can make the cream sauce and have everything ready at about the same time. 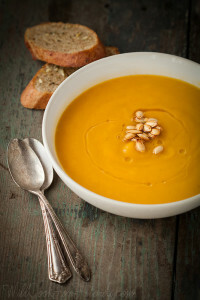 This recipe works well as a side dish (and will serve about four that way) or you can make it as light main course, in which case it will serve 2-3, depending on how hungry you are. You can mix it up by serving the cauliflower over a bed of salad greens, or a bowl of rice, if you'd like to bulk it up a little. Oh wow! I love this recipe! Beautiful colors!! 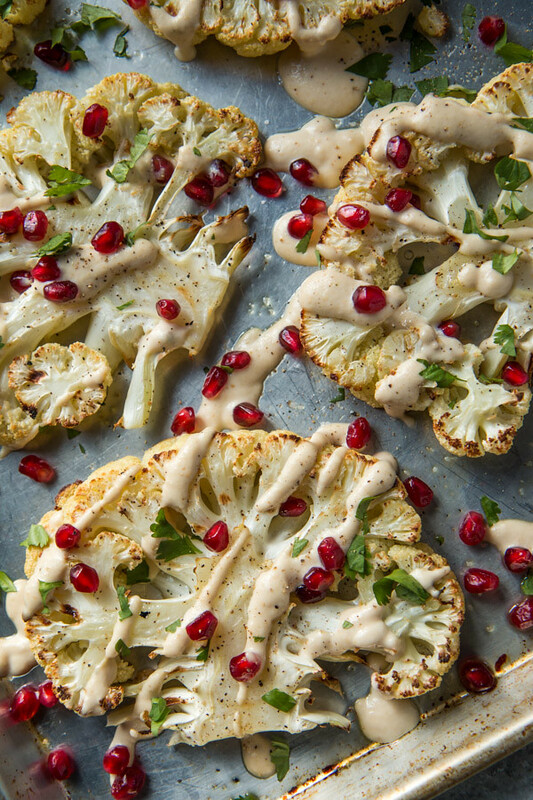 Tahini makes such a great compliment to cauliflower. Thanks Renee! It really does. One of my go-to combos. 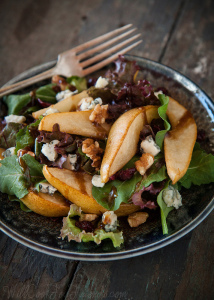 This is such a healthy and yummy recipe! 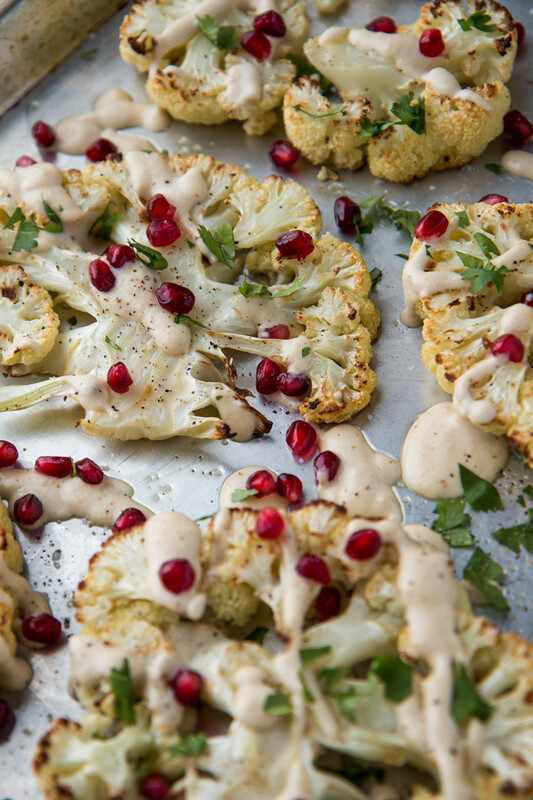 I love roasted cauliflower, and I bet the garlic tahini sauce only brings out the creamy flavor more! Can’t wait to try this! These are absolutely adorable! I love cauliflower roasted, in soups, and batter fried. I really need to try that cashew-tahini sauce. I have all the ingredients! Thanks Andrea! I forgot all about fried cauliflower. Yum! I hope you like the sauce! These are making my mouth water Willow! I’m so happy we got to collaborate on this delicious tahini sauce! Thanks Lauren! Me too. Your recipe looks incredible! Thanks Valentina! Love romanesco too, but for some reason cauliflower finds its way into my cart all the time. I just gravitate towards it. I hope you try this one! i had the same thing, regarding christmas looking food photo colors after christmas, happen to me last year with a crispy goat cheese and greens + pomegranates salad. but oh well, colors at this time of the year are welcomed, right?! i’m such a fan of cauliflower steaks, i make them at least once a week. and tahini… well i love it on everything. Glad to hear I’m not the only one. And yaaasss — tahini on everything! I have a newfound love for tahini (I know, I’m so late!) and I just got a head of cauliflower, so this is totally dinner this weekend! Plus, pomegranate seeds always make things so pretty! It’s never too late to fall in love with an ingredient! I hope you like this recipe — the sauce is so versatile, too. It goes on all my roasted veggies! 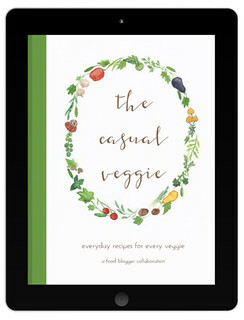 I’m always looking for ways to good cauliflower because I’m not too crazy about the vegetable but want to be. Loving the sound of that garlic tahini sauce! I hope you try this one, Shelly — roasting really brings out the natural sweetness of the cauliflower, and the savory sauce compliments it so nicely. You might start to like cauliflower! OMG. Love this. I’m always looking for new ideas on how to serve cauliflower and this is perfect. Thanks Andrea, I hope you try it this way! Cauliflower is one of my favorite vegetables too. 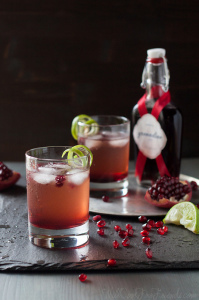 And I LOVE the pops of pomegranate! Hooray for cauliflower! And isn’t pomegranate the prettiest fruit? Every winter I become obsessed with it.